One important design issue we must figure out in order to have a complete schematic of AmpeROSE’s is the automatic calibration mechanism. In this post, I will go over the problem definition, and how we arrived at the two solutions we are considering. Just as a reminder, the current sensing in AmpeROSE will take place on the shunt resistance: a resistance in series with the current path going from VCC to the device under test (DUT), and then to ground. AmpeROSE will work with four measurement ranges, corresponding to four values of the shunt resistance. In order of decreasing shunt values (or equivalently, increasing max. current value of the range). Loss of measurements, as the reading will simply be stuck on the minimal or maximal value of the range. If we have a relatively large values for current and shunt resistance (for instance, a current that should be measured by the small resistance R1 // R2 // R3 // R4 going through R4), a significant voltage drop will develop over the shunt, probably causing the DUT to brown-out. We considered several possible implementations for this automatic calibration, which are presented below. An apparently natural solution would to be to control the switches with GPIOs coming from the microncontroller, and using the current measurements from our external ADC to guide the controller in calibrating the circuit. However, we have settled on a sampling frequency of 100KHz for the current, and determined the attributes of our external ADC accordingly, opting for a 24 bit SAR ADC working with this sampling rate. As 1 / (100KHz) = 10us is more than enough time for a sudden peak in current consumption to damage the measurement, if the resistance is wrong, using our slow but precise external adc won’t do (considering the reaction times of the power supply circuits for the type of DUT we are targeting, we should aim to reach the correct range, which possibly means going from the highest to the lowest one or vice-versa, within 1 to 3 us). A variation of the previous idea would be to use the internal ADC of our microcontroller, set to sample the voltage drop on the shunt at a lower precision, but at a higher rate. This measurement would occur in parallel with the one performed by the external ADC, and would be used exclusively to help the microncontroller determine when to change the measurement range. Due to logistical reasons, we will be using an STM32F767VI instead of a STM32F407ZG as previously discussed. Both microcontrollers feature internal 12-bit ADCs capable of reaching 2.4 millions of samples per second, which could make it possible to perform the three state transitions needed in the worst case within 2us. Furthermore, they feature an analog watchdog mechanism that may be configured to raise an interrupt when the voltage on one of the ADC channels reaches either a minimal or a maximal limit, which would appear to fit like a glove to the automatic calibration. The problem in this case is the burden that would be applied on the processor. Having to service up to two interrupts related to the calibration every microssecond, which would be detrimental to its other responsibilities, such as managing communications with the user interface or the sd card. The issues with the two concepts above led us to consider hardware-based implementations of the calibration algorithm. We consulted the schematics of the Power Profile Kit marketed by Nordic Semiconductors, and ascertained that it contains such an implementation. The image below is an adaptation of the Power Profiler Kit calibration circuit to our number of measurement ranges. The original version may be consulted by downloading the “Power Profiler Kit Hardware Files” in the “Downloads” tab of www.nordicsemi.com/eng/Products/Power-Profiler-Kit and navigating to the third page of the document “PCA63511_Schematic_And_PCB” inside. 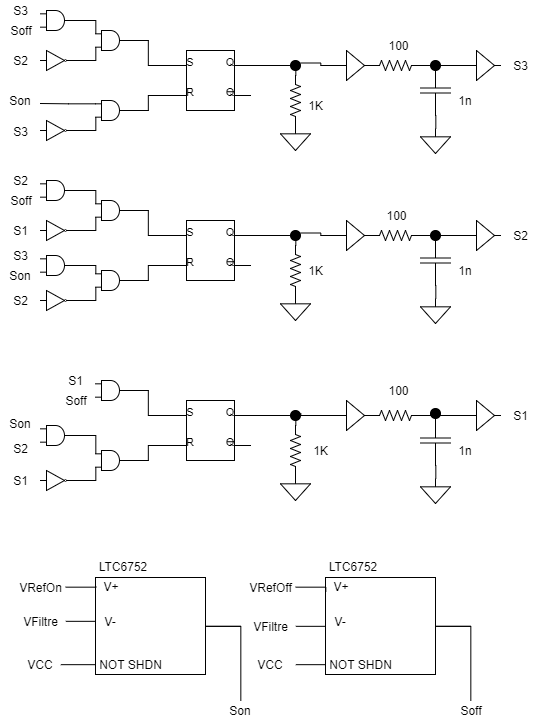 The rectangles in the image are LTC6752 ICs, comparators whose output is HIGH when the input voltage V+ is greater than V- and NOT SHDN is HIGH, LOW when V+ is not greater than V- and NOT SHDN is HIGH, and HIGH-Z when NOT SHDN is LOW. The general idea of this asynchronous sequential circuit is to use the feedback on the AND gates to store the state of the calibration state machine, and transition according to the comparators. Analysing this circuit was fruitful, particularly in terms showing how the LTC6752 could be used, but an options with less components, and simpler to analyse in terms of timing would be preferable, in order to reduce the complexity of the physical implementation on the PCB. This last option uses a standard component of the 74xx family of digital logic components to implement the calibration state machine. Let us consider what happens when DSL is fixed at HIGH, and DSR at LOW, and S0 and S1 can never be high at the same time. The following state machine is then implemented, with the state written as “Q0 Q1 Q2 Q3”. Below, a first version of the connections. A “safe” value is fixed on the parallel input for the case where S0 and S1 are high at the same time, which is not expected to happenn during normal operation of the circuit. The additional state “1111” has the same effect as “0111”, and can only be reached from it when the comparator indicates VFILTRE > VON, so it shouldn’t be dangerous per se. It does imply, however, that going from “all the switches on” to “all the switches off” may take up to 4 clock cycles. 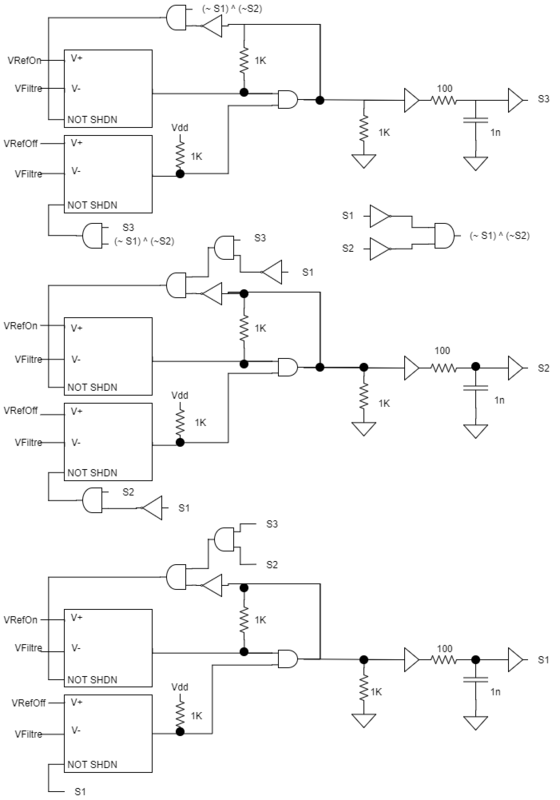 Two possible solutions are to change the equation of S1 to “(VFILTRE > VON) AND NOT Q1”, which requires adding more logic, or to clock the shift register at more than 4MHz. During initial calibration, the processor must be able to control the switches. directly. If we have GPIO to spare, the following connection gives the processor power to bypass the automatic calibration when necessary and assign whatever values it needs to to the register outputs through the parallel input (it adds two OR gates, though). During normal operation it could set the GPIOs 2 to 5 to the “safe” value. The two last ideas discussed seem to be the most interesting options at this moment: one is a simplified version of a design implemented by a working product, and other would require very few components. We intend to perform SPICE simulations of versions of our measurement circuit incorporating both options, in order to validate them and decide on our final design. I’m confused with DUT+/DUT-. Maybe DUTin/DUTout would be more appropriate, as it does not correspond to the voltage of the device under test. You are right sir, the labeling in the image was misleading. I’ve replaced it with one that is hopefully more illustrative.